The U16s squad this week held its final training session ahead of the World Youth Team Championships. 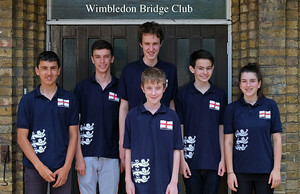 They were supported by various bridge clubs in London, with Wimbledon Bridge Club acting as the base for the three days of practice. The team joined the members for their Wednesday Ploughmans session, where a raffle was held to raise money for the fundraising cause. On Monday the teams attended Young Chelsea Bridge Club and took part in the British Summer Sim Pairs competition which the club was hosting that evening. The U16s played at Richmond Bridge Club on Tuesday, and the members also made a contribution to the fundraising effort. £55,000 has now been raised to support the junior teams. Thanks to all those who supported the juniors and made them welcome on their tour of London.